Oleander is the common and species name for a poisonous evergreen shrub or small tree, Nerium oleander, in the dogbane family Apocynaceae, characterized by dark green, lanceolate leaves, flowers with a deeply 5-lobed corolla clustered at the end of the branches, and fruit in the form of a long, narrow capsule with numerous comose seeds. Oleander is one of the most poisonous plants to humans known. It is found from Portugal in Europe and Morocco in Northern Africa to China. 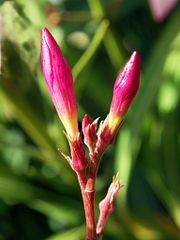 Among other common names is rosebay.. The entire plant, including the milky white sap, is toxic, and any part can cause an adverse reaction. Even a small amount of ingestion can cause lethal or near lethal effects in humans, as well as many other animals, including horses, cattle, and other livestock. Despite its extremely high toxicity, oleander offers important ecological and aesthetic values. Ecologically, various animals can use it for food, such as the oleander caterpillar that feeds only on oleanders. For humans, the showy and often sweetly scented oleander flowers, which come in a variety of colors (white, red, pink, yellow, purple), are used for aesthetic purposes. The plants are used for ornamental purposes in parks, along roadsides, and in some U.S. states as a decorative freeway median, which deer will not consume. Oleander is a member of the Apocynaceae or dogbane family, a a family of flowering plants in the Gentianales order that includes trees, shrubs, herbs, and lianas. Oleander, Nerium oleander is the only species currently classified in the genus Nerium. Oleander grows to 2 to 6 meters (6.5 feet to 19.7 feet) tall, with spreading to erect branches. The leaves are in pairs or whorls of three, thick and leathery, dark green, narrow lanceolate, 5 to 21 centimeters (2-8 inches) long and 1 to 3.5 centimeters (0.4-1.4 inches) broad, and with an entire margin. The flowers grow in clusters at the end of each branch; they commonly are white, pink, red, yellow or purple, 2.5 to 5 centimeters (1-2 inches) in diameter, with a deeply 5-lobed corolla with a fringe round the central corolla tube. They are often, but not always, sweetly scented. The fruit is a long narrow capsule 5 to 23 centimeters (2-9 inches) long, which splits open at maturity to release numerous downy seeds. Oleander is native to a broad area from Morocco and Portugal eastward through the Mediterranean region and southern Asia to Yunnan in southern parts of China (Huxley et al. 1992; Laborde 1989; FOC; FE). It typically occurs around dry stream beds. In the past, scented plants were sometimes treated as a distinct species N. odorum, but the character is not constant and it is no longer regarded as a separate taxon. Other common names for N. oleander include adelfa, alheli extranjero, baladre, espirradeira, flor de São Jose, laurel de jardín, laurel rosa, Laurier rose, Flourier rose, olean, aiwa, rosa Francesca, rosa laurel, and rose-bay or rose bay (Laborde 1989). In Chinese it is known as 夹竹桃 jia zhu tao. The ancient city of Volubilis in Morocco took its name from the old Latin name for the flower. Oleander grows well in warm subtropical regions. It is drought tolerant and will tolerate occasional light frost down to -10°C (14°F) (Huxley et al. 1992). It is tolerant of a variety of poor soils. Oleander also can be grown in cooler climates in greenhouses and conservatories, or as indoor plants that can be kept outside in the summer. Young plants grow best in spaces where they do not have to compete with other plants for nutrients. Over 400 cultivars have been named, with several additional flower colors not found in wild plants having been selected, including red, purple, pink, and orange; white and a variety of pinks are the most common. Many cultivars also have double flowers. Oleander is one of the most poisonous plants in the world and contains numerous toxic compounds, many of which can be deadly to people, especially young children. The toxicity of oleander is considered extremely high and it has been reported that in some cases only a small amount had lethal or near lethal effects if ingested (Goetz et al. 1998). Toxins are present in all parts of the plant, but are most concentrated in the sap, which can block out receptors in the skin causing numbness. Thus, even contact can cause skin irritation. The most significant of the toxins are oleandrin and neriine, which are cardiac glycosides (Goetz et al. 1998). It is thought that oleander may contain many other unknown or unresearched compounds that may have dangerous effects (Laborde 1989). Oleander bark contains rosagenin, which is known for its strychnine-like effects. 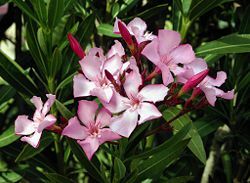 Oleander is also known to hold its toxicity even after drying. It is thought that a handful or 10 to 20 leaves consumed by an adult human can cause an adverse reaction, and a single leaf could be lethal to an infant or child. According to the Toxic Exposure Surveillance System (TESS), in 2002, there were 847 known human poisonings in the United States related to oleander (Watson et al. 2003). 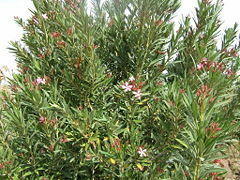 Oleander also is hazardous for animals such as sheep, horses, cattle, and other grazing animals. Around 0.5 milligrams per kilogram of body weight is lethal to many animals, and various other doses will affect other animals. Most animals can suffer a reaction or death from this plant (Laborde 1989). As little as 100 grams is enough to kill an adult horse (Knight 1999). Plant clippings are especially dangerous to horses, as they are sweet. Symptoms of a poisoned horse include severe diarrhea and abnormal heartbeat. Different names for oleander are used around the world in different locations, so when encountering a plant with this appearance, regardless of the name used for it, one needs to exercise great care and caution to avoid ingestion of any part of the plant, including its sap and dried leaves or twigs. One should not use the dried or fresh branches for spearing food, in preparing a cooking fire, or as a food skewer. Many of the oleander relatives, such as the desert rose (Adenium obesum) found in East Africa, have similar leaves and flowers and are equally toxic. Ingestion can cause both gastrointestinal and cardiac effects. The gastrointestinal effects can consist of nausea and vomiting, excess salivation, abdominal pain, diarrhea that may or may not contain blood, and especially in horses, colic (Laborde 1989). Cardiac reactions consist of irregular heart rate, sometimes characterized by a racing heart at first that then slows to below normal further along in the reaction. The heart may also beat erratically with no sign of a specific rhythm. Extremities may become pale and cold due to poor or irregular circulation. Reactions to poisonings from this plant can also affect the central nervous system. These symptoms can include drowsiness, tremors or shaking of the muscles, seizures, collapse, and even coma that can lead to death. Oleander sap can cause skin irritations, severe eye inflammation and irritation, and allergy reactions characterized by dermatitis (Goetz et al. 1998). Poisoning and reactions to oleander plants are evident quickly, requiring immediate medical care in suspected or known poisonings of both humans and animals (Goetz et al. 1998). Induced vomiting and gastric lavage are protective measures to reduce absorption of the toxic compounds. Charcoal may also be administered to help absorb any remaining toxins (Laborde 1989). Further medical attention may be required and will depend on the severity of the poisoning and symptoms. Digoxin immune FAB is the best way to cure an oleander poisoning if inducing vomiting has no or minimal success, although it is usually only used for life-threatening conditions due to side effects. While the reasons are unknown, some visibly healthy oleander shrubs that have become sick or otherwise diseased may generate a type of oil from the trunk and shallow roots. Depending upon the size of the shrub, the oil quantity can vary greatly and has the capability to saturate the soil in its vicinity as the shrub's sickness progresses. This is possibly an explanation for the plant's name of "olea," whose Latin translation is "oil." The oil is light-brown colored and possesses a rancid scent. The toxicity of the oil is unknown, because the neuro-toxic chemicals in the rest of the tree come from the leaves vein-system and not from the pulp surrounding these veins. There is even a species of large, orange caterpillar with black hairs called the oleander caterpillar (larva of the oleander or polka-dot wasp moth) that feeds specifically on oleanders and survives by eating only the pulp surrounding the leaf-veins, avoiding the fibers. Desai, U. R. 2000. Cardiac glycosides. Virginia Commonwealth University School of Pharmacy. Retrieved December 11, 2008. Erwin, V. den Enden. 2004. Plant toxins, cardiac glycosides. Illustrated Lecture Notes on Tropical Medicine. Prince Leopold Institute of Tropical Medicine. Retrieved December 11, 2008. Flora Europaea (FE). n.d. Nerium oleander L. Royal Botanic Garden Edinburgh. Retrieved December 11, 2008. Flora of China (FOC). n.d. Nerium oleander L. FOC 16: 173. Retrieved December 11, 2008. Goetz, R. J., T. N. Jordan, J. W. McCain, and N. Y. Su. 1998. Indiana plants poisonous to livestock and pets. Cooperative Extension Service, Purdue University. Retrieved December 11, 2008. Huxley, A., M. Griffiths, and M. Levy (eds.). 1992. The New RHS Dictionary of Gardening. Macmillan. ISBN 0333474945. Knight, A. P. 1999. Guide to poisonous plants: Oleander. Colorado State University. Retrieved December 11, 2008. Laborde, A. 1989. Nerium oleander L. Poisons Information Monograph 366. International Programme on Chemical Safety (IPCS) Inchem. Retrieved December 11, 2008. Watson, W. A., T. L. Litovitz, G. C. Rodgers, et al. 2003. 2002 annual report of the American Association of Poison Control Centers Toxic Exposure Surveillance System. American Journal of Emergency Medicine 21(5): 353-421. Retrieved December 11, 2008. This page was last modified on 19 December 2018, at 16:29.